The Tea Box: Three names and a publisher! Due to lack of time, today's post will be very short, though I couldn't avoid signalling a real masterpiece: for once I'm not talking of books but of a dvd. The three names are: Gioacchino Rossini, Emanuele Luzzati and Giulio Gianini. 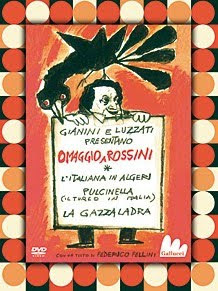 The dvd, Omaggio a Rossini, contains: L'italiana in Algeri, Pulcinella and La Gazza Ladra. Content: the dvd and a booklet where Luzzati's animations are shortly explained, with a preface letter by Federico Fellini and conclusions by Gianini and Luzzati. As I was saying the preface is a letter by Federico Fellini, where the director declares all his admiration for "la fantasia figurativa, l'estro umoristico, il senso della fiaba e le geniali soluzioni grafiche"* characterising Luzzati and Gianini's work. In the conclusion, it's Gianini and Luzzati in person explaining the reasons that induced them to create those wonderful animations without words that are giving voice to chidls' poetics so well, not to infantilism beware! Those animated stories, created between 1964 and 1973, are an essential part in the history of Italian Television and not only: they are extremely precious and poetic documents, produced by tow genial minds, that should never be forgotten. Today, thanks to Gallucci Publishing house, modern kids as well will have fun with the ironic irreverence of Luzzati's characters, they will be enchanted by the vivid colours and the splendid animations by Gianini and, least but not last, by Rossini's music. To conclude this, by Gallucci, is a very important and very high quality operation. Omaggio a Rossini: La gazza ladra-L'italiana in Algeri-Pulcinella. With a book by Emanuele Luzzati - Giulio Gianini, Gallucci Editore, December 2009. * "the figurative fantasy, the humoristic inspiration, the sense of fairy-tale and the genial graphic solutions"
Hi Stella! I'm very happy to have you following my blog. I have been following yours for a while and I find it very interesting, I am flattered you're enjoying mine. :-) Thank you!